After a fun and relaxing holiday I am buckling down to finish the last semester of my Master’s degree in psychotherapy. Just like last semester I am trying to ensure that I am eating well during these busy weeks. It is so tempting to buy food at the cafeteria, but it is important to me to make my own healthy snacks at home and bring them to school. My favourite snacks include trail mixes with nuts and seeds (almonds, walnuts, pumpkin seeds, raisins, dried cranberries, figs, dates, popcorn, and occasionally chocolate chips are my go-tos), fruit, home-made granola bars, home-made cookies (such as blackbean or hemp-seed based cookies), home-made muffins, feaux peanut butter with banana or apple (I love adding cinnamon), hummus with veggies or crackers, and avocado and nutritional yeast on crackers. My ultimate favourite add-ons to any savoury snack or salad is veggie pâté and home-grown sprouts. A lot of these snacks are pretty simple, and I’m sure a lot of them are not new to any of you, but my goal in listing my favourite snacks is to inspire some new creativity among anyone who reads this. If you have any other vegan go-tos, let me know!! I’m always looking to be inspired with food. Moving along to the recipe at hand. Crackers are a tricky food because many of the store-bought ones contain many unpronounceable ingredients. Not only that, but a lot of crackers have a great deal of sodium in them. I’m not saying I never eat things with excess salt or that have been processed, but I try to keep these foods to a minimum. And, that is why one of my new years resolutions is to make my own crackers. Here is a recipe I tried last weekend. It is good with hummus, veggie pâté, or just on its own. It has protein and veggies in it, which is what I look for in snacks. 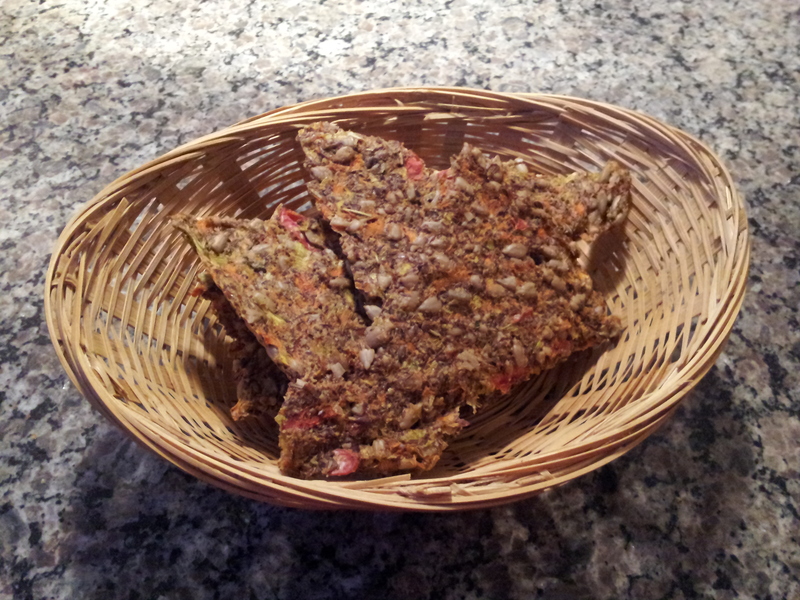 This recipe was inspired by “The Complete Book of Raw Food 2nd edition” edited by Julie Rodwell. I soaked the flaxmeal and sunflower seeds in three cups of water for 6 hours. I then blended everything in a food processor until smooth. The batter was spread about 1/4 inch thick onto three dehydrator trays that I lined with parchment paper. The crackers were dehydrated for 16 hours at 110*F. About six hours in I scored the trays to define how big the crackers were going to be.